Hot Tea is an elegant and responsive Joomla template focused on tea as one of the most popular beverages on the planet. It's not crowded with graphic and its light design with one accent color may be appropriate for many different kinds of websites, not only those related to production of tea. By default, this template has one column. However, as we presented on our demo, it's possible to publish modules on left and right columns if needed. This template comes with many new features that we added in our framework. The first new feature in Tea template is new menu type - off-canvas menu. This is the first our template that doesn't have a classic drop-down menu by default. We are doing our best to follow the best practices in web design and to offer new features. Off-canvas menu doesn't complicate design unnecessarily. User experience with this menu system is the same on desktop and mobile devices. Page transitions is another new feature in the Tea template. Animated CSS3 icon on background will cover the entire screen between loading of pages. 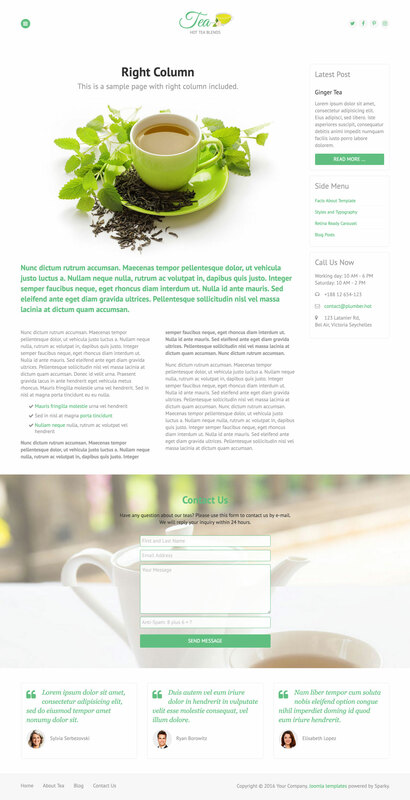 Hot Tea template and its modules support retina screens fully. So, as you can see on our demo, Tea template will display proper images according to the user's screen density using the new HTML5 feature - scrset. To keep design clean, the Tea template has only one column by default. However, if you need left or right columns, they are on some or all pages, they are available. In templates with one column, the textual paragraphs may become too wide. That's why we included CSS3 columns in this template and also in our framework. You can see that some pages have text in two columns. It's also possible to have text in up to six columns. The contact form is included as module on background with parallax scroll. New menu type - Off-canvas and total control of all menus through the framework. You can set functionalities and style of all your menus and drop them directly into the layout. Off-canvas top menu with drop-down sub-levels is included as a default menu. CSS3 and jQuery based animations welcomes visitors of your site. 4 pre-defined color styles. All colors are easily customisable from the Sparky options (infinite color options). We included several responsive Joomla modules with this template. Hot Swipe Carousel (retina ready), Hot Slicebox, Hot Responsive Lightbox, Hot Maps and Rapid Contact module. All these modules are included with this template without additional fees (you save $15 per commercial module).